Now this is my kind of baseball shoe! The Mizuno 9-Spike Vintage G6 low cleats are the classic style of shoe. I loved wearing these cleats and players today love wearing them. It’s the vintage metal cleat with the nice toe protection and the flap on top of the shoe which covers the laces. It’s very nicely shaped and has the Mizuno logo on the side, flap, heel and bottom of shoe. It of course has the nine metal spikes. This company has several different 9-spike shoes but this particular one is all about the metal. This cleat is currently on a super sale on Amazon so you need to get it now. Check all of the options on the ‘Today’s Favorites” link below. After that, continue to read about this Mizuno cleat. I think these are really sharp looking shoes top to bottom. Taking a look at all the pictures and reading the reviews I’m impressed. I don’t see one thing about these that I don’t like. I can’t say that for all cleats. Usually there is one or two flaws. Not with these! I like the overall spike design. Having nine spikes is ideal. What even better is that there are two spikes close together near the toe of the shoe and that gives me peace of mind. Why? There’s just something about having traction where you plant your feet the most. Most people don’t run bases heel to toe. It’s the other way around. I think this nine spike system gives the most traction. I’m not a big fan of seven spike shoes that I see around. This classic Mizuno cleat style worked well 20 years ago and it works just as well today. You can usually get this pair in red, black, blue and white. Currently it’s only available in black. The materials are top quality and while it’s a good shoe for any position I think they really work well for pitchers who need flexibility in the ankles. Check out these other features from this Mizuno men’s 9-spike vintage cleat. Hit play on the video button to see this cleat up close and personal. Mizuno has been around for a long time and players of all ages use them consistently including MLB players. They are known as a company from Japan but they have been very popular in North America for years. With the large variety of quality metal and molded cleats you are sure to find a pair of Mizuno’s to fit your needs and this particular pair is really popular and is on the Amazon top 10 list for cleats. Be sure to purchase this cleat with the right size in mind because I’ve heard these might be running a size too small. I hear that a lot with cleats in general for some reason. As far as cleaning goes, I would wipe them off after each game. You want to keep these looking and functioning good. If you leave dirt on them after each practice and game they will start to look real bad and you’ll have a hard time cleaning them. 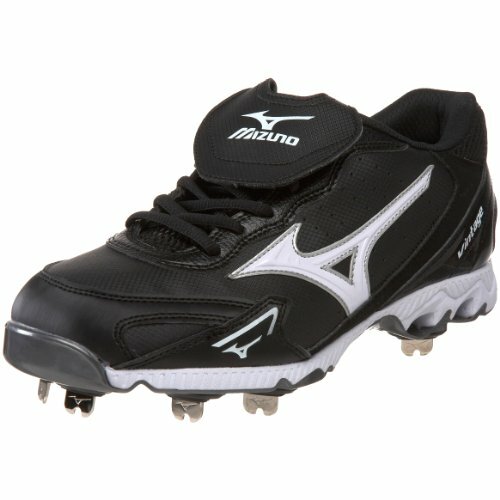 Bottom line: these Mizuno 9 spike cleats are great at a spectacular price. 40 bucks! Are you kidding me? I told you! Baseball gear doesn’t have to cost a fortune. This is a really nice pair of spikes you can get at a decent price for your 2016 season. A good review, my daughter always wore mizuno cleats too.